Every property has a set of codes (rules) that determine what can be built on that site. Whether your site can house a 7 storey apartment block, or a 2 bedroom villa will vary widely from state to state, suburb to suburb and street to street. If you are looking for information on what you are allowed to build on your site, your first port of call should be your local council website. Every local council website has its own design and template but in NSW what is consistent is the legislation terminology. When I am doing research on a new property, this is the order in which I will search the codes. All council’s in NSW operate under a LEP (Local Environmental Plan). 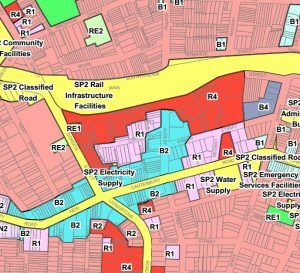 This tells us the zoning of the property in question (for example R4 – High density residential to R2 – low density residential). It will also show commercial, retail and industrial zonings. Some websites allow you to key in your property address and the zoning will come straight up, other websites will require you to download a zoning map which is colour coded which you will then need to search for your address on the map. You should check all the maps within the LEP to ensure that you are aware of any limitations. There are a number of restrictions which will impact your development. These include bushfire, flooding, road widening etc. The LEP maps will identify whether your site is impacted by one of these restrictions. Where the LEP gives an overview of the site, the DCP drills down to the specifics such as building setbacks, height restrictions, floor space ratio (how big your dwelling can be relative to the lot size) etc. Your architect will know the DCP inside out as they need to design to council’s specifications in order for the plans to be approved. Council legislation changes on a regular basis so what was once a rule may be changed and this can be more or less beneficial depending on what you want to do. Just because your neighbour built 3 dwellings on their site doesn’t necessarily mean that you will be able to do the same. Working your way through council codes is a minefield, so whilst it’s good to start the research yourself you should consult a professional before you finalise a purchase or commit a lot of time or money to a development that may not be permitted. On the flip side, understanding a new code that has come in may give you an edge when it comes to negotiating a new purchase and allow you to pick up a bargain. Good developers are able to maximise the potential of a property by having an in depth understanding of the council codes. ← 250sqm lot sizes now achievable in Sydney!